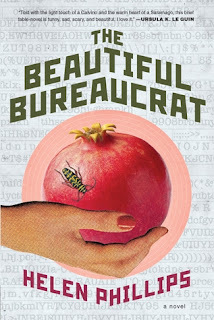 I picked up The Beautiful Bureaucrat, by Helen Phillips, for the gorgeous cover and the fantastic preliminary buzz. Both turned out to be true reflections of this deliciously unnerving novel. A young woman finds a job entering information in a database, "The Database," in a dispiriting, blank, windowless room with an unusually nondescript boss. Her actual function isn't clear as her job is simply updating dates and minutiae in the Database. Her husband also finds employment which is equally mysterious, and soon, seeing him when she arrives home isn't guaranteed. Furthermore, there's a strange man in a gray sweatshirt she encounters often enough that it can't be coincidence. As her seemingly mundane days creep by, she meets just enough people and becomes just curious enough to go poking around where she shouldn't. There's plenty of "that's not right" in this novel, and it creates an irresistible edge. The mystery builds to a surprisingly emotional crescendo which took me by surprise given the nature of the rest of the book. I can't help but be elusive since I wouldn't want to spoil this book for you, but if I had to draw comparisons I'd say "The Yellow Wallpaper" meets Haruki Murakami. Do with that what you will, and I hope you will pick this one up. I have not heard one bad thing about this book. And the cover!! I've wanted that for the cover so I'm glad to see it's so good! I couldn't think of a single book that was similar to this one, but I can see Murakami a bit! I loved it and posted my review today as well. Oh, I love The Yellow Wallpaper/Murakami comparison! So much buzz for this one lately. I was offered a copy but I know I won't read it anytime soon and am trying not to be selfish. LOL! But...how can I resist? This just came in at the library and I couldn't remember hearing about it and ordering it, so I'm glad to know it's good! Ooo how can I resist a "Yellow Wallpaper" comparison? YUP, those comparisons are spot-on. I'm glad this one did it for you! Mine is set to be delivered this Friday. I cannot wait!! I couldn't figure out why I liked this book so much (did my review today)and then read this post. "irresistible edge" and "deliciously unnerving" are right on lady! "The Yellow Wallpaper" meets Haruki Murakami? Hell, yes!